The blue-black-white flag was first consecrated at Otep?? on the 4th of June, 1884, as the flag of the Estonian University Student Association. During the following years the blue-black-white flag became a national symbol. One of the older fraternities was named "Vironia". "Vironia" is a Latinized form of the word Estonian word "Virumaa" which means "the province of Viru". "The word "Viru" in both Finnish and old Estonian refers to Estonia. "Vironia" was founded in 1870 in Tartu, Estonia's second largest city and also its leading educational center. In 1881, Tartu University Theology student Jaan Bergmann, wrote a poem praising the black-white-cornflower blue flag of Estonia. The poem laid the foundation for the acceptance of the Estonian colors by "Vironia". On 29 September of 1881, "Vironia" took on as its color the cornflower blue-black and white flag. On 07 April 1882, "Vironia" publicly displayed its colors at a student parade in Tartu. Within a few short years, the "Vironia" fraternity flag had gained quick and wide acceptance among native Estonians as representing the "Estonian" national colors. 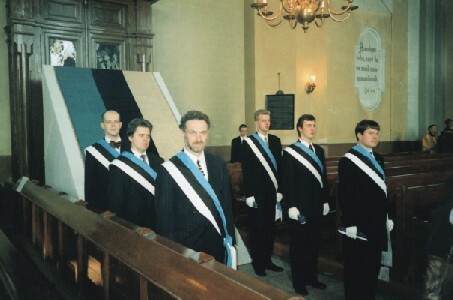 Here it must be noted that although the current colors of the Estonian Collegiate Society (Eesti �li�pilaste Selts) are blue-black-white, the original blue-black-white colors belong to "Vironia". In 1888, "Vironia's" official "keeper of the flag" changed his allegiance. He left "Vironia", took the "Vironia" fraternity flag with him and joined the "E�S". From that day forward, the E�S took on as its colors the cornflower blue-black and white flag. "Vironia" was left with no choice, it had to select new colors. From 1917 to 1936, all of the available German and Russian military uniforms were altered or re-tailored to be more "Estonian" in origin. A small blue-black-white cockade was affixed to all peak caps. For the Estonian military, shoulder boards, medals and sleeve patches centered around the cornflower blue-black-white motif. The Estonian Air Defense Force (EADF) (Eesti �hukaitse) adopted as its national recognition symbol a triangle made up of the colors blue-black-white. In addition, the rudders of all Estonian military aircraft were painted in the colors of the Estonian flag. This triangular recognition symbol continues to be used by the EADF to this day. Estonia, along with Austria and the Netherlands, is one of the few nations of the world to use a triangle device as roundel on its military aircraft. In 1936, the 1918 vintage Estonian military uniforms were redesigned, now resembling a British/German mixed cut. Sini-must-valge 100 aastat (The blue-black-white 100 years); Artur Taksa; Eesti �li�pilaste Selts Vanematekogu Kirjastus; Montreal, Canada, 1982 (Estoprint Ltd., Canada) (750 copies of the book were made). About the blue shad of Finlad flag , that is difficult to say. The blue colour of the Estonian flag was not fixed till the nineties. I don't think that shade of blue changed, the makers of the flag were using a blue which was nearest to the blue of a cornflower. I think the two blues were the same before WWII, but then the Finnish blue was made darker.According to "Valtioneuvoston p��tos Suomen lipun v�reist�" of the 16 September 1993, nr. 827, the blue of the Finnish flag is officially defined as PMS 294 C, ( for the state flag the red as PMS 186 C and the yellow as 123 C). I am an historian, and I know exactly - before World War II (the first Republic) the blue tone of Estonian flag was "sky-blue". That means strictly opponent to the dark! (It must be a clearly optical difference between blue and black!). I have found a link in your page to an Estonian Flag with the right blue color (historical true, since 1884 as a flag of Estonian student corporation, until 1940 as a national flagg) blue color. That is�� http://www.customs.ee/intro/eng/insignia.html.